Finding the perfect stone material for your countertops doesn’t have to be a stressful experience. 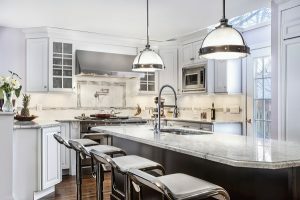 When you undergo a mission to find the perfect stone countertop there are a lot of things that need to be taken into consideration. Stones vary in color, application, durability, and care. As a result, understanding the best material for your unique purposes becomes a vital component of any upgrade or remodel process.There are a variety of shades and colors that are found among various stones which make it quite overwhelming to choose the best one. Here are just some options available depending on your specific needs. Granite continues to be the popular stone of choice for most homeowners looking for a strong and durable material. Typically, granite countertops are found in kitchens due to their ability to withstand a lot of wear and tear. In fact, granite is used in both residential and commercial properties due to its resistance to heat. The surface can be changed from polished to honed, thereby creating a custom feature to call your own. As a result, Granite has become the go-to material for many looking to enhance the look and feel of a space. Quartz is a manufactured surface. As a result, there is a broad range of color options to choose from. While quartz finds itself being just as durable as granite, its proponents value its low-maintenance stain-resistance as a reason for choosing quartz over granite. For many who love to entertain in large kitchens, having a quartz countertop provides them with a durable material that doesn’t require a ton of maintenance to keep it looking polished and beautiful. Marble is an elegant and natural stone that makes for a wonderful countertop material in any room of a home. In fact, marble is known to be beautiful and complement any hue. However, marble also tends to be extremely porous which means that it must be sealed when installed and maintained regularly. This entry was posted on Friday, June 16th, 2017 at 10:48 am. Both comments and pings are currently closed.